Bulgur wheat: Place a pot on medium-high heat and add boiling water (½ cup). Add the wheat and boil gently for 8-10 minutes until tender. Drain and season. Meatballs in cream sauce: Boil the kettle. Using the same pan on medium-high heat, add the onion with a pinch of salt and pepper and cook for 5 minutes. Then add the garlic and butternut with boiling water (½ cup), cover with a lid and cook for 5 minutes. Pour in the cream and stir, then add the meatballs back into the pan. Season and let it simmer (gently boil) with the lid on (leaving a slight gap so the cream doesn’t bubble over). Simmer for 10 minutes until the butternut is almost cooked. 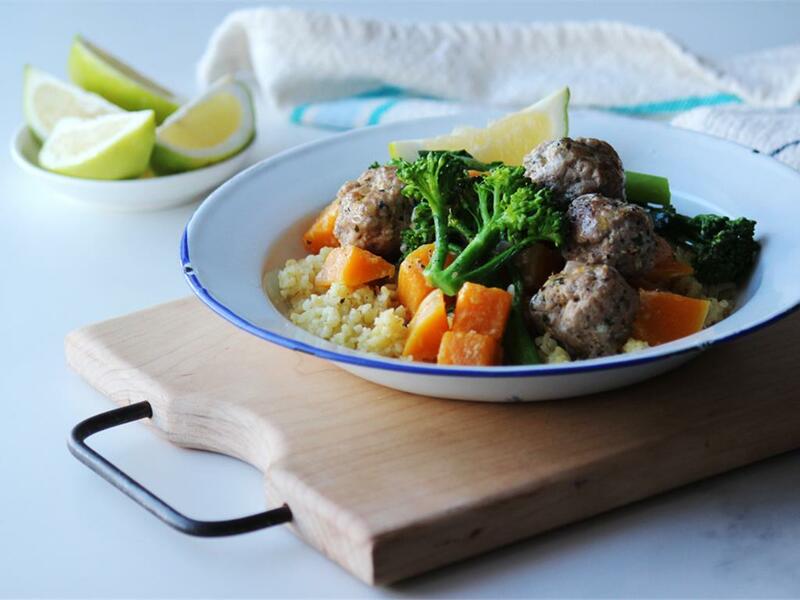 Place the tenderstem broccoli on top of the meatballs and butternut and cook for another 3 minutes with the lid on (slight gap) until the butternut, meatballs and tenderstem broccoli are all cooked.